I have often wondered what an entire city, region or country would be like if it were designed by Frank Lloyd Wright. I think it would raise the human spirit because of his obsessive search for beauty and meaning in the built environment. I also think that it would be exasperating in practical terms, because it would often ignore the practical for the artful, creating unending problems for visitor and owner alike. From oddly shaped, tight spaces to chronic maintenance problems, leaking roofs and other never ending practical concerns, I think it would require the patience of Job and the appreciation of art no matter what the cost to own a Frank Lloyd Wright building. The Price Tower is the only "skyscraper" ever designed and built by America's greatest architect. And without the ultimate benefactor, Harold C. Price, an entrepreneur and risk taker in the oil pipeline business, this one of a kind building would never have been realized. As with all great architecture, it always takes two to tango. And, in the case of the Price Tower, America's most gifted architect collaborated with the perfect client, who had the money, the spirit and the willingness to see it through. The Inn at Price Tower in Bartlesville, Oklahoma was originally designed as an office building with apartments for tenants. Like many great mid-century buildings, the Price Tower fell victim to the vagaries of uninformed, insensitive owners, the impact of exposure to the elements and the technical and cultural changes that inevitably cause a building to fall into obsolescence and, ultimately, into disrepair. And, as one would expect, the history of exactly how this unusual building came to be is convoluted and complicated. For a detailed timeline and "inside baseball" account of the tower, you can read Prairie Skyscraper on the tower website. Saving such a building usually involves people with great passion for the art they want to preserve and tons and tons of money. After years of misuse and decline, Phillips Petroleum donated the building to The Price Tower Arts Center. Through their efforts and many benefactors, as well as the very sensitive design efforts by architect Wendy Evans Joseph, this great little tall building has been repurposed as a nineteen room boutique hotel, which makes the trip to Bartlesville worth at least one night's stay for design seeking Nomads. For the uninitiated - Bartlesville is NOT a destination. About an hours drive from Tulsa, this prairie town of 36,000 has nothing to offer vagabonds looking for excitement, unless you are really interested in Phillips Petroleum or its wealthy founder, Frank Phillips, and the wild animal preserve Woolaroc. The oil giant, now headquartered in Houston, was founded in Bartlesville. No boutique spas or five star restaurants greet the Nomad looking for a good time in this small enclave not far from the southern border of Kansas. However, if you want to experience the intense design quality of one of Frank Lloyd Wright's most innovative structures which has become a striking boutique hotel in the only skyscraper ever designed and built by America's most egomaniacal architectural genius, Bartlesville is the place to go. As was his tendency, Wright referred to his one and only built skyscraper in poetic "organic" terms. And it is organic and its is poetic. The building, particularly the interiors, "reads" mostly like Joyce Kilmer, with some William S. Burroughs thrown in to keep you on your toes, literally. First and foremost, the interiors of the hotel have been restored almost to perfection. Fortunately, the interior design by Architect Joseph complements Wright's mastery of space, without simply copying him. The finishes, the furniture and the accessories are thoroughly modern and enhance the experience of the spacial dynamics of the original design. It has been well established that Wright based much of the scale of his interiors on himself. He was only about 5'6". 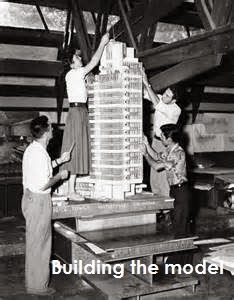 It makes perfect sense that a narcissist of the first order like Wright would dimension his buildings to "fit" himself. This practice is very evident in most of his buildings. However, in his defense, he also utilized this design slight of hand as a device to enhance the experience of "exploding" larger and more grand spaces, like the two story suite we stayed in. I highly recommend this room type when you stay. Not only is the bed to die for, but, the interior space is truly a delight and the view out over the town and prairie beyond through two story glass is worth the few extra dollars. Some areas of the hotel, particularly the unit stairs, doors and other access ways are very tight, forcing one to deal with Wright's obsessive adherence to the angular geometry established as part of the basic design. And, in the interest of full disclosure, the air conditioning was on the fritz the night we were there. To their credit, the management offered to refund our money and set us up in a nearby hotel, but, being very tough nomads, we rejected that offer. As I told the concierge - What's a little heat when you're enjoying Wright up close and personal? And once the sun went down, it was more than comfortable. This was our forty first anniversary trip and we did not want to spend it in a Holiday Inn Express! We were more than rewarded for our unwillingness to settle with the great views out over the town and prairie with the Oklahoma sun setting in the west. The hotel has Copper, a bar and restaurant on the fifteenth floor with outdoor terraces to enjoy the food and more views. However, we were there on a Monday and, alas, Copper was closed. However, we were able to enjoy a nice continental breakfast on one of the outdoor terraces. Decent food and, again, outstanding views. Just know that the elevators that take you to this floor will only hold 2-3 people. Very European in a mid-century modern kind of way. And finally, the docent led behind the scenes tour of the building is well worth the nominal ten dollar fee. It opens with a short documentary film, after which the docent takes you through many of the spaces not open to the public. Our docent, a transplant from I forgot where was informative and at times utterly hilarious. Her knowledge of the men, the building and the many myths about both was fascinating. After the building tour, I recommend spending about two hours driving around Bartlesville to see some of the eccentric houses designed by Oklahoma's most famous architect, Bruce Goff. Like Wright, Goff, who designed his first building as a teenager and later became the head of the school of architecture at The University of Oklahoma, was also an adherent of organic architecture. His houses are worth seeing for those of you who want to see organic design at its edgiest. Just ask the concierge for the list and search them out with your I-phone. Great way to spend an afternoon in the metropolis of Bartlesville. As we loaded the car for the next leg of our road trip, I felt like the vagabond that had found yet another gem. 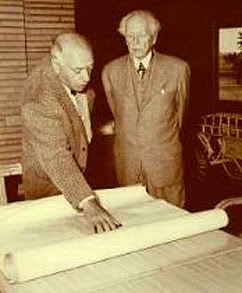 I realized, once again, that Frank Lloyd Wright, who was called many things during and after his controversy filled life, was, after all is said and done, a truly great architect. And, I was thankful that someone had the vision, the passion and the money to ensure that this building in this place is still here in all of its imperfect glory. Travel Quote of The Week - "Give me the luxuries of life and I will willingly do without the necessities." - Frank Lloyd Wright. Don't tell me old Frank was not a vagabond at heart! Video Artist of The Week - Alabama Shakes - Purveyors of "Roots Rock" - This edgy group, yes they are from Alabama, lays down some great grooves, combining, folk, rock and country for a completely unique sound. This alert is not about travel unless you count the ten minute drive from our place to the local football stadium. It is about college football, America's greatest sport, at its best. Baseball may be America's pastime, but, college football brings out the passion of red blooded Americans like no other sporting endeavor. Hyperbole not withstanding, the athletic contest this weekend past, between two titans of the college football world, was truly epic. And I was there. COLLEGE FOOTBALL GROUND ZERO - Bobby Bowden Field at Doak Campbell Stadium, Tallahassee, Florida. During the day, it was discussed ad nauseum. ESPN's College Game Day was on the campus of Florida State University, my alma mater, to cover yet another Game of The Century in my home town. Herbstreit, Fowler, Howard and Corso, along with numerous other experts and talking heads, opined on every facet of what would, indeed, become an epic sporting event. As the sun began to set, ushering in a classic fall night in God's Country, eighty thousand plus football fans, who will return to normal lives come Monday, went utterly insane for four hours watching two powers of the gridiron play what will surely go down as a football game that will be discussed in epic terms for years. The University of Notre Dame, with its tedious fan base, its arrogant you know what coach and its Machiavellian myth machine was in town to play the reigning National Champions, the Florida State Seminoles, who have become the latest success story that sports media and many football fans love to hate. This is a result of sports fan's penchant for wishing the worst on the best and the off field antics of its Heisman winning, gregarious, twenty year old football savant quarterback, Jameis Winston. All of that is for another blog in another place, but, I had to mention it for context. The famed ESPN analyst, Beano Cook, once said that football is a religion in the South. He explained the passion of southern football thusly - "In the north, they hang losing coaches in effigy, but, in the south, they actually hang the coach". Now I have never witnessed an actual coach lynching, but, you get the point. So, even if you are not a football fan, you can surely understand the passionate desire of most of the eighty thousand football fanatics to return the pious Golden Domers of Notre Dame back to South Bend with a loss. The game was one of those rare events that you need a strong heart to survive. As I joked to our crew, this game had it all - pathos, comedy, frustration, ineptness, brilliance and, above all, great football. With great play from both teams, this epic gridiron battle of two national powers came down to two plays, one penalty and thirteen seconds. With the score FSU-31 & ND-27, Notre Dame was on the three yard line, after driving the length of the field in about five minutes. Fourth down and goal. Things were not looking good for the 'Noles after a brilliant second half by Winston et al to take the lead. 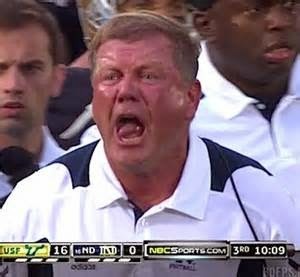 Upon completing a walk in pass for an apparent touchdown, Coach Brian Kelly and his Fighting Irish began to celebrate. But wait - You could hear the whispers of those fateful words from the football gods and FSU alum Lee Corso- "Not so fast my friend". Indeed, the small yellow piece of laundry lay in the end zone for all to see. As a weary, emotionally spent crowd of insane football fans waited for what seemed like an eternity, the referee announced an offensive pass interference penalty, known in football vernacular as a pick, against the usual beneficiaries of football karma. the Domers of South Bend. 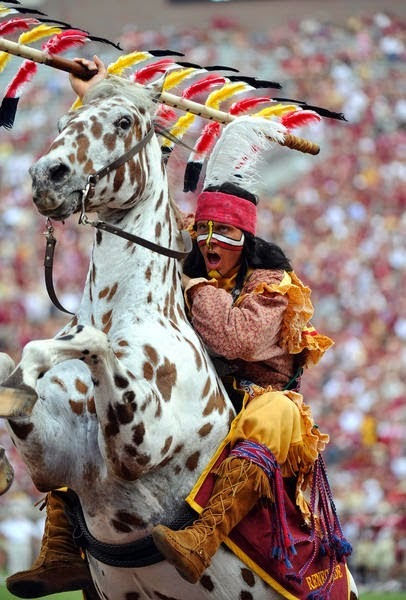 But on this good night, the unconquered Seminoles would not go quietly. No touchdown - Replay the down - said the man in the striped uniform. 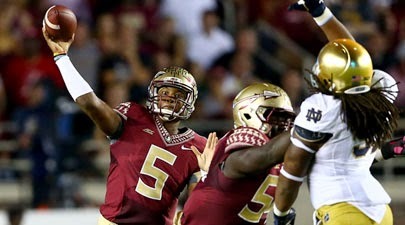 With a scant thirteen seconds remaining, and the ball now on the eighteen yard line, Notre Dame quarterback and future Heisman candidate, Everett Golson, whose arm was hit by defensive back Jalen Ramsey as he released the ball, threw a wounded duck interception into the hands of streaking Seminole linebacker Jacob Pugh in the back of the end zone. Then, the deafening sound of eighty thousand screaming normally normal spectators permeated the crisp fall air, erupting into a cacophonous insanity that non sports fans would call utterly stupid, mindless celebratory behavior unbecoming to right thinking, otherwise intelligent people. Am I embarrassed? I am not. 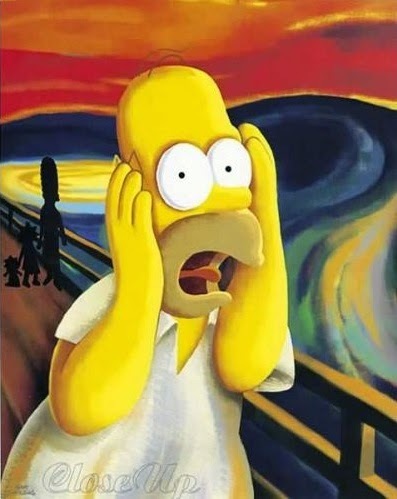 Without the emotional release of college football, I shudder to think what the maladjusted, nomad or couch potato, might do during the course of their, otherwise, normal lives. So there you have it. Not all great trips require long distance travel. Sometimes, the best of the best is right around the corner. I remember when I saw the Statue of David for the first time, thinking - 1)Leonardo was indeed brilliant and 2) Man that thing is big. This Saturday night past shows that brilliance comes to Nomads in different ways. Both art and spectacle do, indeed, make life better. And for those of you that can't get enough, this pregame hype video is just for you. NO! The Nomad Architect is not dead or even near death. I loathe referring to myself in the third person, but - hey - it's the times we live in. I mean how many times a day do we here some hip hop guy or some super star athlete or semi-talented starlet or even a common 15 minutes of fame seeker refer to themselves in the third person? I mean its sooooooo tedious. But, not to worry - because - At the end of the day (an utterly worn out cliché), it's really about showing up isn't it? Well, I was gone and now I am back. As of today, I promise to deliver SOMETHING urbane and , if not witty, at least winkingly humorous, every week. And I promise to NEVER, EVER refer to myself in the third person again, unless it is done as a literary slight of hand to make a valid point. circles, that would place me in the same category as one of the no name starlets referenced above (i.e. - a clueless slacker of the first order). After all, I know for a fact that many of my countless fans wait with great anticipation to learn of the many exciting and earnest attempts by myself to alert them to the best places to lay their weary heads near and far. But wait - I say I am not a slacker, for even though I have seen the future and it is laden with wonderment, scintillating observations and answers to everything you ever wanted to know about cool places but were afraid to ask, LIFE can get in the way! That's right my fellow Nomads. The mundane demands of daily living can derail our most valiant efforts to go hither and yon. So don't tell me about your problems - I got enough of my own! Events - involving real estate, moving/relocation and unwanted encounters with that most ubiquitous purveyor of bad, and expensive, news - doctors - have conspired to force me to not write about the many trails I wander down, happy and otherwise. I am officially back from the travails of daily life that can force us away from the important things, like self actualization and having a twenty year old Bordeaux under a shade tree in an Oregon wood with your one and only sitting right next to you. I AM HERE TO SERVE! And serve I shall. Among other things, I will be bringing news of the good, the bad and the utterly beautiful we found on the prairies of Oklahoma, the beauty, natural and man made, of Southern Arkansas and some of the best of Texas. That is what is known as a teaser. From The Wine Trails of Georgia to the surreal environs of Venice, I hope I can encourage you to get off your duff and go!! BTW - Several changes have been made to the blog, if you are interested. I have cleaned up some of the support pages (about, design, sleep and eat), as well as the side bars. Also, you may notice a new header. It's the Inn at Price Tower in Bartlesville, Oklahoma by none other than Frank Lloyd Wright. Check out our visit next week.